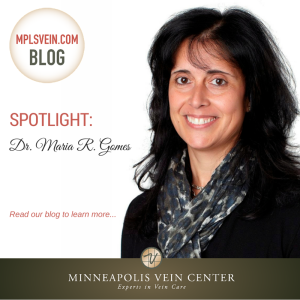 This month, we’re shining the spotlight on our very own Dr. Maria Gomes, fellowship trained Interventional Radiologist and Medical Director at Minneapolis Vein Center. Dr. Gomes has over 20 years of experience in the field, and has been with Minneapolis Vein Center (MVC) since 2005 when the center opened. What’s the best New Year’s Resolution for a healthier 2016? Speaking of vascular health, what is the biggest misconception about varicose veins? “The biggest misconception about varicose veins is that you just have to live with them, which simply isn’t true.” Varicose veins are usually caused by a disease known as venous insufficiency. If left untreated, the appearance of varicose veins, and associated symptoms, are likely to get worse. “Many doctors still don’t refer patients for vein treatment, which is unfortunate because there are many excellent minimally invasive treatment options available for patients today.” If you have varicose veins, you don’t have to live with the discomfort, swelling, and pain. Schedule a vein consultation to learn more about your condition and treatment options that may be right for you. Dr. Gomes most enjoys how the team at MVC is able to help patients look and feel better. “It truly makes a difference in our patients’ lives.” The team at MVC can treat more than just varicose veins. The center offers several other interventional radiology services including treatment of leg ulcers and tendon pain, as well as epidural steroid injections for back pain. “I like spending time with my family, especially my three grandchildren.” When not chasing after her grandchildren, Dr. Gomes stays active with outdoor activities including (her favorite) paddle boarding.